The 1st ROBO-ONE auto sponsored by Biped Robot Association, took place at BANDO KOBE SCIENCE MUSEUM in Kobe City, Hyougo Pref. on Feb 25, 2017. ROBO-ONE Light 14th also took place on Sep 25th and 4.5m Footrce as the preliminary ROBO-ONE 30th Tournament and the main event ROBO-ONE 30th Final Tournament took place on Sep 26th. The major regulation of the 1st ROBO-ONE auto were just autonomous robot could join the tournament and the weight of robot, which was 5 kg or under. Details of the body regulation were described in the 30th ROBO-ONE, the 14th ROBO-ONE Light Regulation and the 1st ROBO-ONE auto. (in English) Side punch has been prohibited since ROBO-ONE 23rd Tournament in the robot fight. Sixteen robots joined the competition. The tournament winner was Ko-Bis by Bisko. The 2nd place was SunShot by Osaka Electro-Communication University Jiyukobo-HRP. The 3rd place was Garoo by Kumama. Result of the tournament is here. 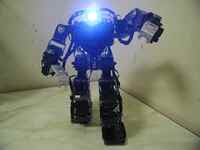 My autonomous robot, `BLACK TIGER NEO` also joined the tournament, however he dropped out of the ring and lost the game. Almost autonomous robot had sensor system as PSD and/or ultrasonicwave sensor. 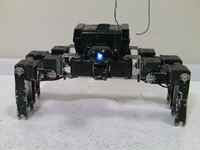 It was difficult for alomost autonomous robot to find the robot in long distance such as 1 m over. Otsuka-san joined the tournament with his autonomous robot `Babbo-auto` and uploaded reports (1) (2) (in Japanese) of the details of tournament and also all videos of the 1st ROBO-ONE auto to his YouTube Channel.